Migrants arrive on the British vessel HMS Enterprise before disembarking in the Sicilian harbour of Catania, Italy, Oct. 6, 2015. The U.N. Security Council has given the go-ahead to a European Union military operation targeting human traffickers and smugglers in international waters near Libya. The operation aims to stem the rising flow of migrants and refugees making the often deadly trip across the Mediterranean from Libya to Europe. The European operation, called Sophia, after a migrant baby, began Wednesday, but received near unanimous council-backing on Friday. Only Venezuela broke the consensus, abstaining in the vote. Under the British-drafted resolution, European naval forces are authorized for one year to stop and search vessels in international waters off the coast of Libya that they suspect of smuggling migrants and refugees. They may also seize and dispose of empty boats to make it harder for criminal networks to repeat their illicit activities. Refugees and migrants found on the boats will be taken to safety in Europe, while smugglers will be prosecuted. 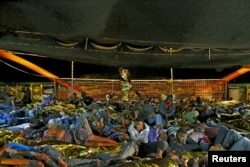 Migrants prepare for a night's sleep on the deck of the Medecins sans Frontieres (MSF) ship Bourbon Argos off the coast of Libya, August 7, 2015. British Ambassador Matthew Rycroft said the measure would be one part of the solution to a huge challenge. “Sadly, action against the smugglers on the high seas won’t solve this crisis alone; but, it will send a message that people cannot profit from this evil trade with impunity. It will save lives,” he said. Council members agreed on the need for a comprehensive approach that deals with the root causes spurring a half-million people to flee their homes for Europe so far this year — conflicts in the Middle East and Africa, poverty and extremism. In the past, the EU focused on search-and-rescue operations in the Mediterranean Sea — but with this year's overwhelming flood of migrants from Syria, Iraq, and other hot spots in the world, thousands have ended up dying at sea while trying to reach European shores. Libya’s envoy said his government would cooperate with the European operation, but urged that it be carried out with full respect for his country’s sovereignty. According to the latest figures of the International Organization for Migration, 2,989 migrants have died in 2015 while attempting to cross the Mediterranean Sea and 580,238 have landed on European shores. Also Friday, Italy flew the first group of migrants to be resettled throughout Europe as part of a new EU relocation program to share the burden of Europe's migrant crisis. Nineteen migrants from Eritrea were flown from Italy to Sweden, part of a plan to resettle an estimated 160,000 refugees from Italy and Greece.